The Azusa Pacific University Professor of Art History presents and signs Stay Up! Los Angeles Street Art, which was released at the end of last year. 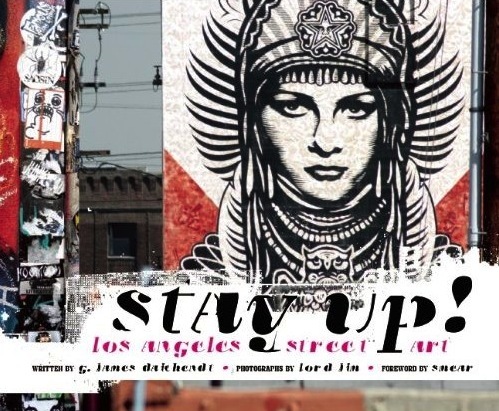 The book explores the phenomenon of street art through interviews with several L.A. artists. Besides investigating the differences between graffiti and street art, Stay Up! also goes into the major themes of the L.A. scene and presents beautiful photos by Lord Jim. Live Talks LA presents a conversation between the founding members of the Rock Bottom Remainders, an all-author rock band that features the Pulitzer Prize-winning Dave Barry on guitar and the creator and executive producer of "The Simpsons" Matt Groening on cowbell. Barry also discusses his just released novel, Insane City. At any Chinese celebration, one thing is guaranteed: There is going to be a ton of food. The kitchen ninjas of Starry Kitchen, Thi and Nguyen Tran, celebrate Chinese New Year with an epic, five-course family-style Prix Fixe for $50. Menu items include Slow Roasted Sesame Oil Spare Ribs, Salted Duck Egg Cereal Prawns and a Black Sesame Panna Cotta. Note: You can also order their signature Crispy Tofu Balls or Singaporean Chili Crab (by reservation) for an additional cost. VIP tickets to the inaugural event are already sold out, but you can still be added to the wait list for general admission ($40 for 3 p.m.-6 p.m. admittance). You don't want to miss the celebration of all things bacon, with dozens of restaurants and bakeries presenting their sweet and savory best. Admission also includes access to check out all the cool cars housed in the Petersen. Make sure to bring your dancing shoes to this one, as no one encourages you to lose all abandon and just sweat out all of your frustrations on the dance floor like these two. Goulding and St. Lucia's Jean-Philip Grobler do electro pop right and should make for quite the evening to remember. The pair also perform at the Palladium on Tuesday. Noodles are one of my favorite comfort foods, and if you appreciate them as much as I do, this is your event. For $55 you get seven types of soup noodles, beer and cocktails, with proceeds going to My Friend's Place. Restaurants providing the oodles of noodles are Din Tai Fung (Taiwanese Beef Noodle Soup), Maximiliano (Filipino Chicken Noodle Soup), M.B. Post (Vietnamese Oxtail & Beef Brisket Pho), Rodded (Thai Duck Noodle Soup), Seoul Sausage (Korean Army Soup), Tsujita LA (Japanese Tsukemen) and Whist (Korean Noodles). VH1's non-profit organization promoting instrumental music education in public schools presents an evening of amazing music. From the rocking jams of the Parlotones, LaZae and the Moon Shines to the smooth tunes of Jason Joseph and Isabel B, there's something for everyone. And your admission fees directly support Save the Music.